BRENDAN Irvine is hoping the experience of last summer’s Olympic Games can stand him in good stead as he prepares to defend his Irish flyweight title against Mayfield’s Tomas McCarthy at the National Stadium in Dublin on Friday. The St Paul’s man reached Friday’s final thanks to a comprehensive 5-0 win over the man he beat in last year’s final, TJ Waite and will go into the final as a big favourite to retain his crown against McCarthy who edged out Adam Courtney 3-2 in the other semi-final. Irvine said it was a much more enjoyable battle with the Ormeau Road man this time than last year’s cat-and-mouse affair and feels this will help him on Friday. “I’m feeling good. I had a good fight there on Friday and I’m happy with how that went and how the game-plan went,” he said. “It was different this time. Last year it was very cagey and obviously it was the final so there was more at stake, but this year it was a completely different fight altogether. Despite being favourite to retain his title, Irvine insists he has not allowed himself to look too far ahead and dismisses the notion that the semi-final was a tougher assignment than this weekend. “Everyone was saying that (semi-final) was probably going to be the final, but I never really look at it that way,” he stressed. “This is another fight, another stepping stone so I have to look at it like that and break it down – small steps at a time. The Glencolin man admits he is not overly familiar with McCarthy having not boxed him before, but he did watch the Corkonian’s semi-final on Saturday and expects the final to be more of a chess match than an all-out war. “I have never boxed him before,” he confirmed. “I watched him on Saturday there so I know what way he fights. “I will just have to do my own thing, listen to my coaches and stick to the game-plan they come up with. I just need to keep focussed and sharp. 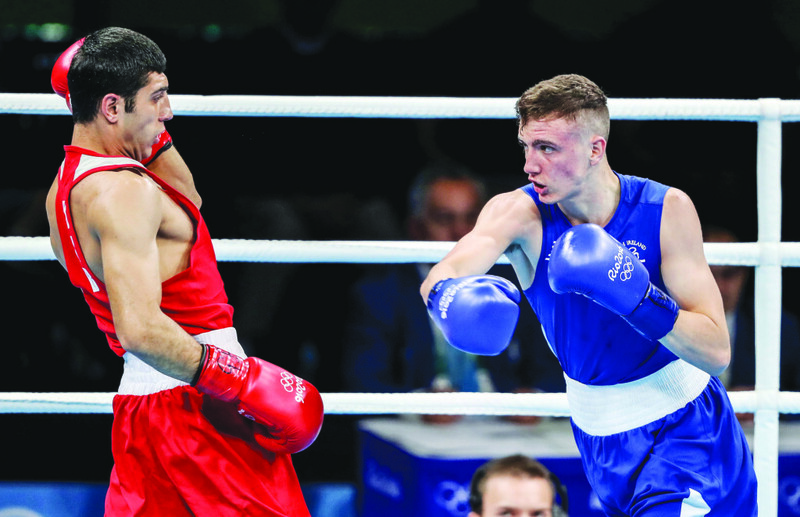 The experience of Rio and finals’ night gives the 20 year-old West Belfast man an edge going into the final and having performed on the biggest stage of amateur boxing, walking out at the South Dublin venue will hold no fears. The prize is of course the chance to retain the National Elite 52kg title, but an added incentive is that victory will almost certainly secure him a place in the Irish team that will box at this year’s European Championships with the chance to go on and qualify for the World Championships that are to be held in Germany in August. “When I am going into the ring now I’m thinking I’m at the Seniors with just a couple of hundred watching whereas at the Olympics there were thousands so it’s completely different,” he explained. “There is a lot at stake this year with the Europeans and Worlds. That’s what I am aiming for to get me back on track.